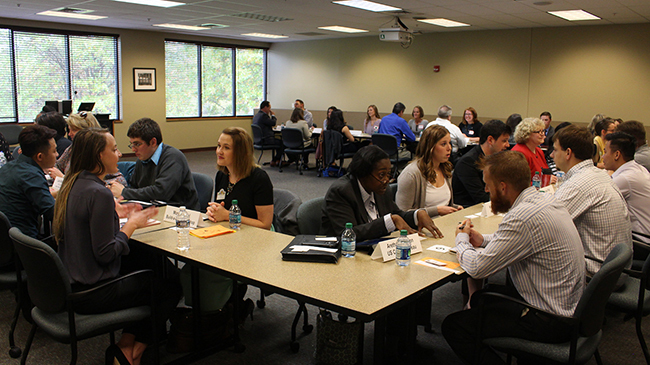 IU Southeast business students interact with local business leaders at the pilot “speed networking” event organized by the Career Development Center and the School of Business. (NEW ALBANY, Ind. )—There were jitters, nerves, butterflies. 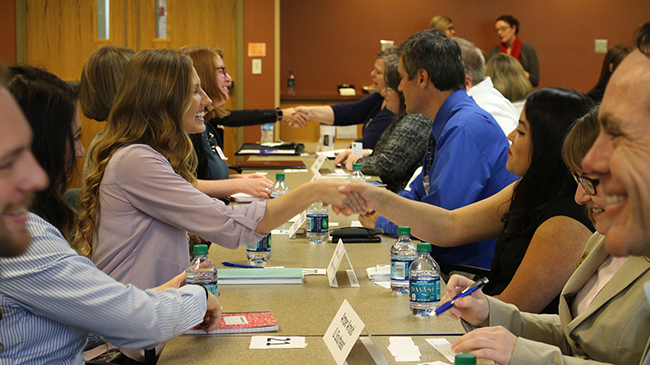 Then the whistle blew and the room exploded into conversation as 22 IU Southeast business majors and 19 local employers plus three faculty and staff, came together for a pilot “speed-networking” session organized by the IU Southeast Career Development Center and the School of Business. The students were juniors and seniors enrolled in W-430, Organizations and Organizational Change. The employers were business owners, human resource officers, and other professionals from the Louisville Metro area. The event came together after School of Business Dean David Eplion and Professor Ken Harris discussed ways to better prepare students for small talk, building rapport and job interviews. Harris had learned of speed-networking events through AACSB, the international accreditation body for business schools, as a modern way to hone so-called soft skills that form the unscripted social component of many important careers. Ranging from effective communication and confidence to creative thinking, flexibility and the ability to improve performance through feedback, soft skills are now seen as vital ingredients in a job-seeker’s portfolio. Eplion and Harris met with Danielle Leffler, director of the Career Development Center, who had been working to refocus the CDC’s outreach around school-specific student career preparation needs. The group decided to collaborate on a pilot event involving Harris’ W-430 class, which brings together business majors with concentrations in professional selling, supply chain and information management, and human resources, among others. While Harris prepped his class on how to engage with businesspeople both as potential employers and as human beings, Leffler sent out invitations to partners through several networks, including the local and university Society for Human Resource Management (SHRM) groups. The final group of participants included representatives from a wide variety of organizations, including Horseshoe Southern Indiana, Northwest Mutual, LG&E and the U.S. Census Bureau, as well as smaller niche employers such as All Fur Fun Stay & Play Dog Care and Build-A-Bear Workshop. The eclectic mix presented students with the opportunity—and the challenge—to engage with individuals from different organizational cultures, a critical component in building professional networks that can not only help them succeed in attaining their goals, but also help their organizations flourish. “Soft skills are everything,” said Kaitlyn Gibson, development and marketing coordinator for Leadership Louisville Center, a nonprofit, member-oriented organization whose mission is to grow and connect a diverse network of leaders who serve as catalysts for a world-class community through civic programs, executive education, leadership courses and events. “Soft skills are everything”: students practice the fine arts of social interaction at the speed networking event. Gibson, who graduated from IU Southeast with a degree in marketing and management in May, 2017. She had worked at Leadership Louisville Center as an intern and part-time employee, and was offered her current full-time position upon graduation. She was excited to return to campus, and to help the students benefit from her experience. For the students, who are used to grappling with sociotechnical systems, environmental dependencies and the evaluation of formal change programs, making small talk and exchanging business cards might seem like a snap, but it’s an art, and mastering it requires confidence, empathy, quick wits and a dash of showmanship. During the session, each student met with ten conversation partners for four minutes. While attendance was required, conversation topics were not. Students were free to form their own approach to learning about their partners and offering information about themselves, finding the magical balance that would encourage a would-be employer remember them. The room buzzed as both sides spoke, listened and learned. Soon jitters were overcome and the students hit their stride. Eye contact, handshakes and introductions flowed in a natural give and take, anecdotes and personal interests blended seamlessly with informational queries and responses. At the conclusion of each conversation, business participants evaluated the students on their level of preparation, their verbal skills and their general direction, including their personal goals and confidence in their abilities. These results will be collated by the School of Business and shared with the Career Development team, ultimately to be offered as constructive feedback to the students, who will also receive information on how to follow up with the employers. The partners also filled out an evaluation form for the event itself. Judging by the enthusiasm in the room, students, faculty and partners found it a useful and energizing exercise. For her part, Leffler would like to make the event a regular feature on the CDC calendar, with participation open to all. “My hope is that other students will want to do this after they see how successful it is,” Leffler said. Students were bullish, finding value both in the skills being built and in the real life contacts they were able to make with local business leaders.